We're back! What a wild week that was. We covered about 4000km which was pretty hectic but we saw some amazing things: Firstly leaving Tsume, we visited the largest meteorite ever found. It weighs nearly 60,000kg and was huge. Made of 85% iron, no wonder it ways a ton (well, 60). At Rundu we stayed on the southern banks of the Okavango River, on the northern side lies Angola, FM were really excited to be eating dinner in one country whilst looking at another. The next day we drove 500kms across the Caprivi Strip to Katima Mulilo, still in Namibia, on the southern bank of the mighty Zambesi river, with Zambia on the opposite side. Here we saw our first wild hippo, in the middle of the river doing a huge yawn. Max was mesmerized! We were well and truly in a malaria area, so had a fun time using Andy Murray to bash any mossies in our room. All our clothes reek of citronella now. On Friday (19 Sept) we drove south from Katima and out of Namibia into Botswana. We stayed in a wonderful lodge just near Kasane on the banks of the Chobe river and did some serious safaris: On the first afternoon we went on a boat safari and saw hundreds of elephants, drinking, swimming and playing. Incredible - there were so many it was surreal. Also saw a water monitor lizard, fish eagle, hippos and, to Fms delight, a whopping great crocodile! Check the photos On Saturday we went to Victoria Falls, where the Zambesi river falls 100m into the gorge below. It is now the dry season, so parts of the falls were quite dry and we could see right down into the gorge. Other parts were still very fast flowing, and the noise and white water were very impressive. We got quite wet in some places, which was nice as it was really hot - Floss and Max moaned a lot. We went with a tour operator into the Zimawean side, which was a little alarming but we managed to get out again ok! 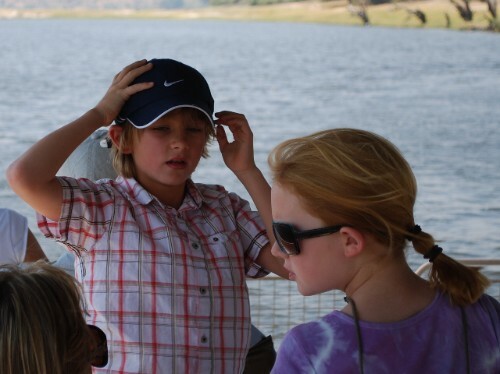 We stayed a third day in Chobe: Floss, Max and Stef did a last safari drive and saw two lions!! Unfortunately, the first was asleep under a tree andit was nearly dark when we saw the second one but we just managed a photo as proof for Pete (who was really miffed that he missed them). We also saw a rather sick looking giraffe, which, when we passed it later had died. Floss was unconsolable! On Monday 22 Sep we started the long haul back to Johannesburg. The first stage was 500km to Francistown, Botswana's second largest town. The road from Kasane included a stretch midway of about 50km with the most horrendous potholes - some over a foot deep and peppered all over the place. Nightmare. Tuesday we drove down to the capital, Gabarone, crossing the Tropic of Capricorn again on the way. Roads much better now. Lastly, today, we crossed over back into South Africa. Tomorrow we fly out to Singapore, four days early as we are now desperate for chinese food. Will be back with tales of adventure again soon..